Located in the hills of Terres Basses, Grand Bleu Villa is a new favorite amongst all who visit. Enjoy a good book while soaking in the sun or sip champagne as you watch the sunset over the horizon. Perfect for couples, Grand Bleu makes for a terrific get away from the everyday stresses of life. 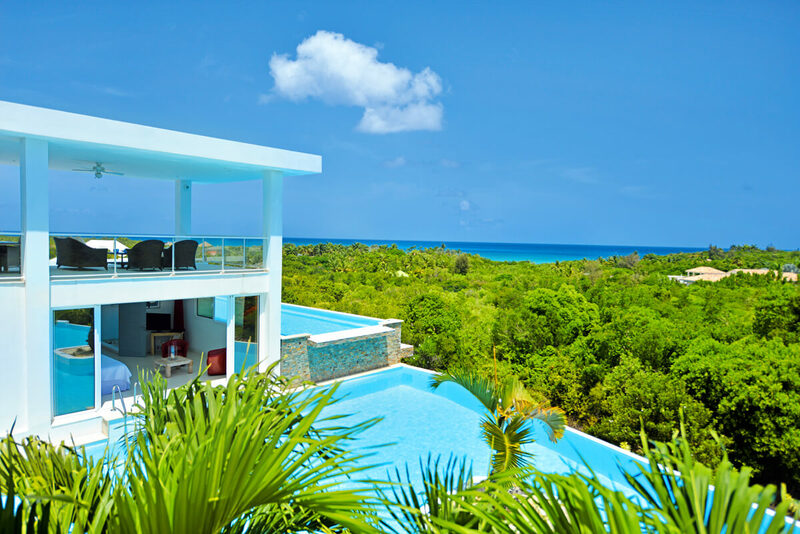 This 4 bedroom, 4 bathroom luxury retreat offers both accessibility and convenience. Located on the hillside of Terres Basses, Grand Bleu is the perfect location for couples and families to get away! The living areas are open to the elements and embrace a contemporary lifestyle with modern furnishings. Enjoy preparing a delicious caribbean feast in the state of the art kitchen before dining al fresco. Each bedroom includes king sized beds as well as en-suite bathrooms. One bedroom is located on the main level while the other three bedroom are located below on the lower level. 10 minute walking distance to Plum Bay Beach.